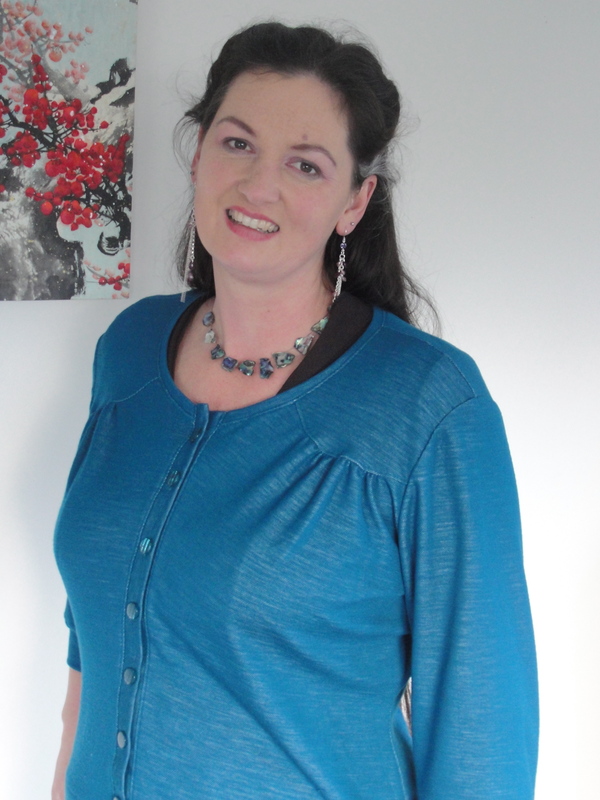 My lovely and talented friend Kat has just launched the first pattern of Muse Patterns, the Jenna Cardi. 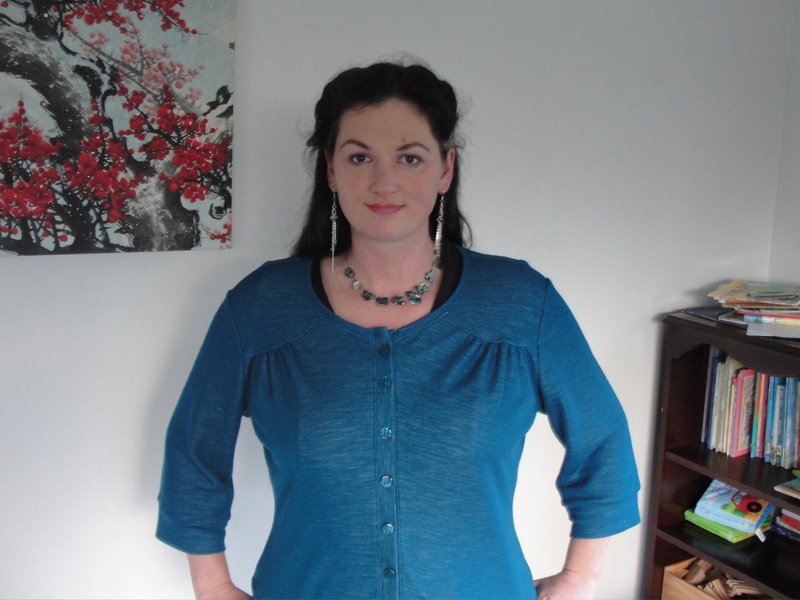 Over the last couple of years I have occasionally eyed up various knits and considered making my own cardigans, but I hadn’t come across a suitable pattern or anything I really liked, so I’m really glad this was the first pattern Kat released. It fills a gap in my me-made wardrobe, and as I really like the styling and how easy it is to make I have another two or three in the works. For some reasons all the cardigans I currently have in my wardrobe are blue and I’m getting really sick of them. But, umm, yeah, this one is blue too. But not really ’cause it is turquoise and all the others are navy! So, onto my first make. The pattern has two different front variations, but I am completely taken with the “B” variation which has a shoulder yoke and little gathers. Nicely showcased in the larger photo – pity about the facing of my dress popping up, I really must sew that down one day. I wasn’t sure what size to pick as my bust falls into the 46″ size and my waist and hips are in the next size bracket down. I made up the 46″ and it is a bit big for me. However I didn’t take it in at the size check step during construction as I wanted to make it up exactly as per the pattern, and although my next one is cut out in the 44″ size I’m quite happy with this one as a relaxed fit cardi. In the photos I am wearing it over a dress with 3/4 length fullish sleeves. 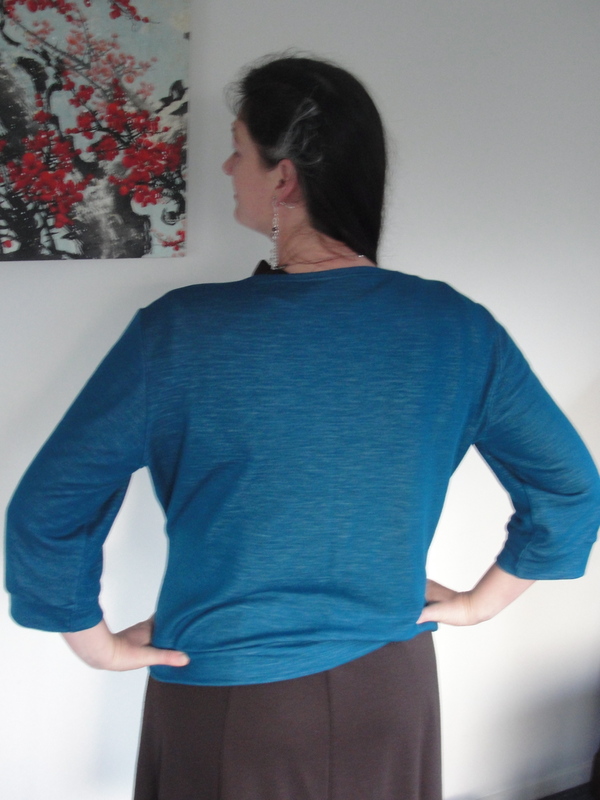 M y fabric is a merino/modal mix from the Levana factory shop in Levin. My mother and I took my Nana there to get the fabric to make her a capsule wardrobe for their upcoming overseas holiday. I’m not quite sure how it happened, but for some of the garments we made we had bought way too much fabric, so even after making a longline cardigan for my Nana, there was enough of this fabric left for me to make a garment too. Sadly I couldn’t *quite* get the long sleeve version out of the offcut, so chose the 3/4 sleeve. The only beef I have with this fabric is how slippery slidey and wriggly it was to cut out & sew. I could not have sewn the top stitching in the garment without a walking foot. Now that it is made, I love how soft and snuggly the fabric feels. Even though it is too big, you can see the curve of the shaping in the side seams here. Muse patterns are designed for an hourglass figure and that’s me. Yay! Hmm, you can also see there is some odd spacing going on with the buttons. My automatic button hole “feature” was playing up, and really made me wish for a manual over-ride on my machine. Such a pretty colour on you. I love this view too and it will be the one I make first, only short waisted, for summer! Yay, cos it is in its way, isn’t it?? Sorry MrsC, your comment got hidden in my spam queue and I only just found it! Thanks. And yay for summer! The cardi is lovely, and you’re so damn photogenic to boot! I was googling for images of this sweater before I plunged in and bought the pattern, that looks great! Let us sew cake, let us eat cake!